Andy Pye reviews the work of Barden Corporation in providing the high precision bearings required for marine gyroscope applications. As critical navigational aids that run continuously around the clock, marine gyroscopes require super precision ball bearings that are reliable, low friction and quiet, ensuring a long operating life. Typical marine gyroscope applications use angular contact ball bearings in a back-to-back configuration mounted at either end of a drive shaft. The bearings are often oil-lubricated with ceramic balls and extremely smooth mirror finish raceways to reduce noise levels and friction. The bearings are cleanroom assembled and the rings are 100% visually inspected for defects to ensure a long operating life. A gyrocompass is a marine device that is able to detect the direction of true north and not magnetic north. Variations in the Earth’s magnetic field that deflect normal compasses do not affect a gyrocompass. The gyroscope inside a gyrocompass system is mounted in such a way so that it can move freely to enable its axis of spin to settle parallel with true north when influenced by the Earth’s rotation. A gyrocompass is used to navigate the ship, find positions and record routes. 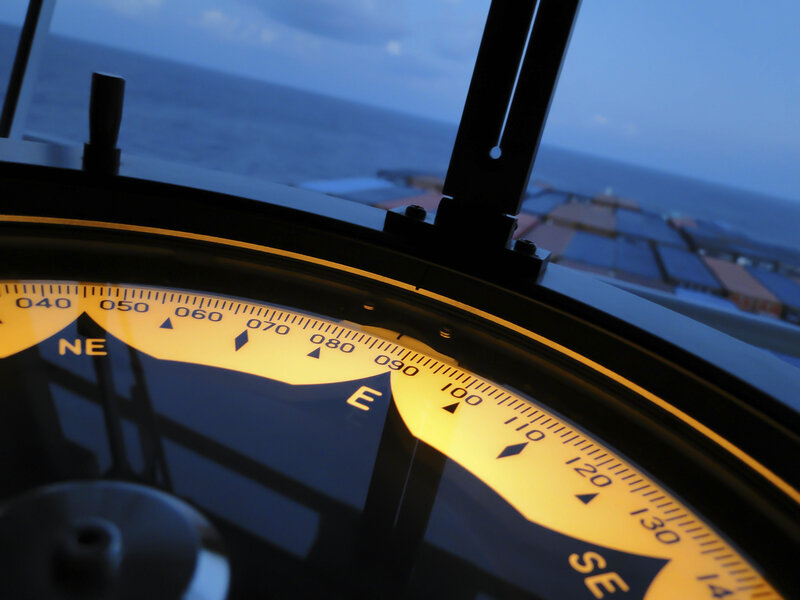 Modern ships now use a GPS system or other navigational aids to feed data to the gyrocompass for correcting any errors. Typically, for marine gyroscope applications, Barden provides angular contact ball bearings with an extremely robust, single piece polymer cage, with either steel or ceramic (silicon nitride) balls. An increased ball complement is usually provided to ensure lower noise levels and an increased operating life. As gyroscopes run continuously at all times, the operating life of the bearings is critical. Most gyro bearings are oil-lubricated rather than greased, although some gyroscopes do use greased bearings. A typical gyroscope application will incorporate two oil-lubricated open (not sealed) angular contact ball bearings with an oil sump between the bearings. This is sealed with a wick material that soaks up the oil and transfers it, drop by drop, to the bearings. This oil is returned back to the sump and the lubrication process is repeated. The oil itself is normally a military specification synthetic oil. Ball bearings for gyroscopes rotate at speeds of around 10,000 to 12,000 rpm, so in terms of Barden’s super precision bearings, this is relatively low speed. Barden bearings are manufactured to ABEC 7 standards often with raceway roundness held to limits that exceed the ABEC standards requirement. The bearings are assembled in class 100 cleanroom conditions. The bearing rings are 100% visually inspected in order to check for any defects on the raceways. This process is critical to guarantee a long operating life of the bearings. Any slight scratch or scuff mark on the rings can trigger wear, which could lead to a reduced operating life of the bearing and premature failure. Bearing cages are normally made from special materials such as polyamide-imide, a high temperature plastic with good wear resistance. These robust cages can operate in temperatures in excess of 200°C. Typically, a bearing for a gyroscope has a bore diameter of around 5mm. Two bearings are normally required – one on each end of the rotor shaft in a back-to-back configuration. Another key requirement is that the gyroscope operates with low noise levels. The bearings are therefore fitted to the system and bench tested. Barden gyro bearings achieve low noise levels by their low friction properties and extremely smooth ‘mirror finished’ raceways. This is further enhanced by the use of low friction ceramic balls and 100% visual inspection of the bearing rings to eliminate any defects.